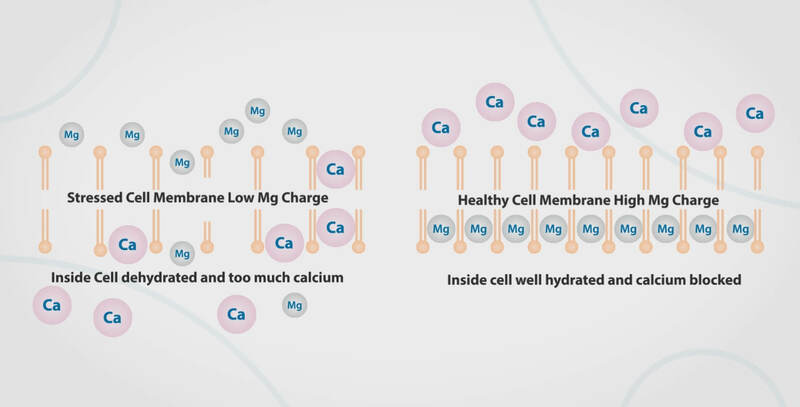 When magnesium is lost excessively the cell membrane becomes compromised and ‘looser’ because the electrical charge drops. That means the cell wall is not as good anymore at holding in electrolytes. The membrane starts to lose integrity, potassium can leak out and the cell also loses water, leading to excessive dehydration. This loosening effect also allows in more calcium and sodium, which are larger molecules. Some athletes have suffered cardiac arrest (heart muscle cramp) in the middle of a marathon when magnesium levels got critically low and too much water was lost. Calcium tightens and sodium stimulates, which starts a cascade of dehydration and the ‘squeezing’ effect we know as cramps, twitches, restless legs, (VIDEO) as well as the vascular constriction of hypertension. 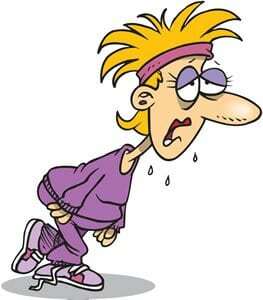 When the body becomes dehydrated it moves to a water-conserving and rationing status. It releases vasopressin – a hormone which constricts blood vessels so that more water is shunted to the brain, as the brain must take priority with water usage. If the body is in a state of drought it will also message the kidneys to retain more sodium, which then retains more water and can lead to tissue swelling (oedema). In this state the proper elimination of toxins and wastes is diminished and can lead to septic conditions. The best remedy is to give the body the water and electrolytes it needs to flush out wastes, allowing the kidneys and waste elimination system to return to normal. Remember that magnesium is the best calcium-channel blocker – the natural controller of how the body uses calcium to its best advantage. Calcium contracts the muscle fibres, but magnesium relaxes again by its rehydration and removal of calcium back to the extra-cellular spaces. To help the body release this pressure and return to normal hydration drink more magnesium water – mixed as per instructions above. You can also add a small amount of sodium chloride salt if you have been perspiring a lot. For fast relaxation massage into your muscles: Elektra Magnesium Cream plus extra sprays of Elektra Magnesium Oil Spritz (formula). Magnesium Charge Lotion can also help rapid muscle recovery. Why is Magnesium so Important for Health? Why is Transdermal Absorption Better? Magnesium is now becoming a big revolution in natural health as industrialised societies suffer more and more under stress and are looking for ways to compensate without relying on drugs or surgery. Transdermal absorption of magnesium salts is the best way to absorb magnesium, as no digestion of tablets is required. Only a very small amount of oral magnesium tablets and powders gets digested and passes through the gut wall to the inner tissue areas of the body where it is mostly used. The majority of these oral magnesium supplements are expelled by the digestive system and can cause diarrhea. Transdermal absorption is much more efficient and works more quickly with calming effects being felt within minutes of massaging into skin or soaking in a hot magnesium solution footsoak or bath. It is using the same dermal pathways as sweating which releases electrolytes from the skin. The skin is also capable of absorbing electrolytes back in as long as they are in the right form. You can also do it by swimming in the ocean or bathing in mineral rich hot springs. Massaging with Elektra Magnesium products delivers the magnesium and other elements and nutrients more conveniently to the skin. From the skin (epidermis) the body takes up what it needs via the tiny capillaries of the dermis under the skin and is self-regulating. 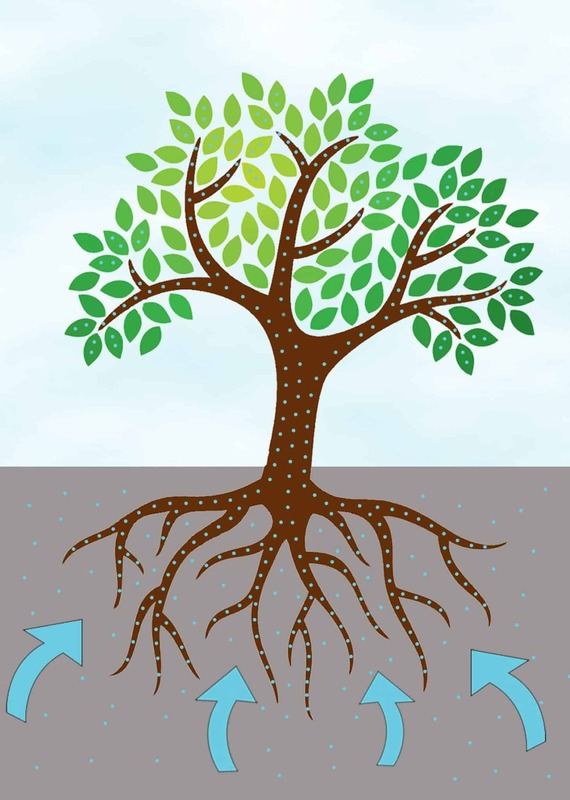 It does not take up any more than it needs at one time (like tree roots taking up minerals from the soil). Unlike drugs or herbs, you cannot overdose. (Ref: Transdermal Magnesium Study Via Magnesium Cream). It’s just nutrition provided to the largest organ of the body – the skin. Feeding the body by feeding the skin makes a lot of sense… and feels sooooo good! Why are Magnesium Chloride Flakes Better Than Oral Tablets and Powders? Chloride is the most abundant negative ion in the body. For us to be able to use the metals of magnesium, sodium, calcium, potassium etc, they need to be bound to chloride to be ionised and fully absorbed into the water molecule – in a sense swallowed up by the water. In that form (eg. 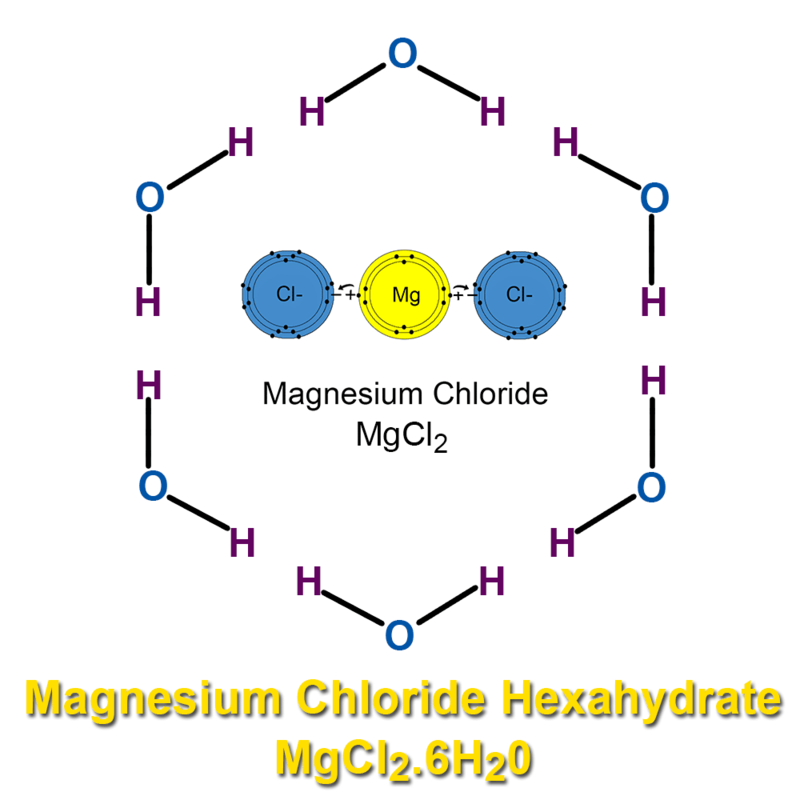 magnesium chloride, sodium chloride) the electrolytes are biologically available. Together, and as a solute in the water, they conduct the bio-electricity of the body. 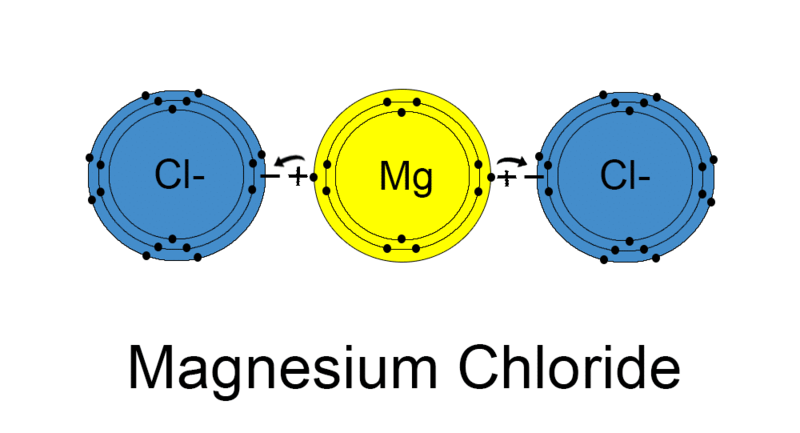 The ‘cation’ of magnesium in ‘magnesium chloride’ is bound up with chloride ‘anions’ so that the compound shares electrons in the outer shell to become stable. It becomes easily soluble in water, and therefore more accessible to cells. Compounds such as magnesium oxide that are much less soluble are therefore less accessible to cells. Magnesium chloride however, once dissolved in water, gets access to cells without further digestion required. Magnesium Chloride Hexahydrate is ideal because it is a compound of magnesium chloride bound up in a crystal matrix of six water molecules – hence the name ‘hexa-hydrate’. This is the form that occurs in naturally dehydrated sea water after skimming off the sodium chloride part (to make table salt). The chemical notation is MgCl2.6H20. The crystal salt flakes are usually 47-48% magnesium chloride, 1-2% other sea trace minerals, with the other half of the flakes being crystalized water. This is why the flakes are so hygroscopic – that is, their ‘charge’ attracts water from the atmosphere and they can start to ‘sweat’ and become sticky if there are humid conditions and they are exposed to air. If left out long enough, they will become fully saturated with the water and turn back into the liquid magnesium salt solution called ‘magnesium oil’ (which came from the brine that came from the sea water). The magnesium chloride in crystalized or liquid form just contains less or more water. When you take oral tablets and powders of various magnesium compounds (magnesium joined to another element), they have to be digested in the stomach using hydrochloric acid. The older we get the less stomach acid we make and the more difficult it gets to digest. Also, after the body separates the magnesium from the other element and the tablet’s fillers and binders, it joins the magnesium molecule to chloride for solubility and access to cells. All this takes a lot of extra time before you feel the benefit of the magnesium. By the time it can get through the bowel wall several hours later it is a much smaller quantity that is available for cells than if you soaked in magnesium chloride solution (magnesium flakes in water) or applied it to the skin as a magnesium skin care product. The gut wall can only take up a small dilution of magnesium – such as what would be in spring water or foods. Higher concentrations are eliminated via the digestive system. Scientists have found that, “the absorption of magnesium decreased with increasing magnesium concentrations.” This is why high concentrations in oral supplements tend to be wasted so much. When you take too much magnesium supplement orally the bowel contents become loose and watery, finding their way into the toilet well before you get the benefit of all that magnesium. Via the skin there is no digestion required because the magnesium chloride solution is already in the right form for cellular uptake. You can feel the benefit of the magnesium much sooner and absorb a higher quantity. Remember, the body takes what it needs, but no more – just like the tree roots take up minerals from the soil but no more than the tree needs. It is naturally self-regulating. Permeation of Topically Applied Magnesium Ions Through Human Skin is Facilitated by Hair Follicles (2016).